In this practical tutorial, you will build a simple example Django application with a form styled with Bootstrap 4. In this tutorial, you'll be using django-crispy-forms, a popular package that makes it easy for Django developers to create beautiful forms easily and without re-inventing the wheel. In this tutorial, you'll also be using Bootstrap 4—the latest version of the most popular CSS and HTML framework for building HTML interfaces—to style the form. The django-crispy-forms enables you to quickly add and render Bootstrap 4 styled forms with a few lines of code. A working knowledge of Django. Next, you need to add accounts in the INSTALLED_APPS array inside the settings.py file of your project. Since django-crispy-forms supports multiple styles, you also need to specify the CSS framework you want to use in your forms. That's all what you need for installing and setting up django-crispy-forms. Installing the django-crispy-forms application, doesn't add Bootstrap 4 to your Django project. Adding Bootstrap 4 is quite easy, you can either head over to its official website at getbootstrap.com and download the files in your project's folder or you can also use Bootstrap 4 from a CDN. See the docs for more information. We use the container, row, col-x and justify-content-center classes to create a simple layout with a one row and one column. If you don't specify the template name, Django will assume you are using a accounts/user_form.html template. You can also use the as_crispy_field template filter on individual fields. 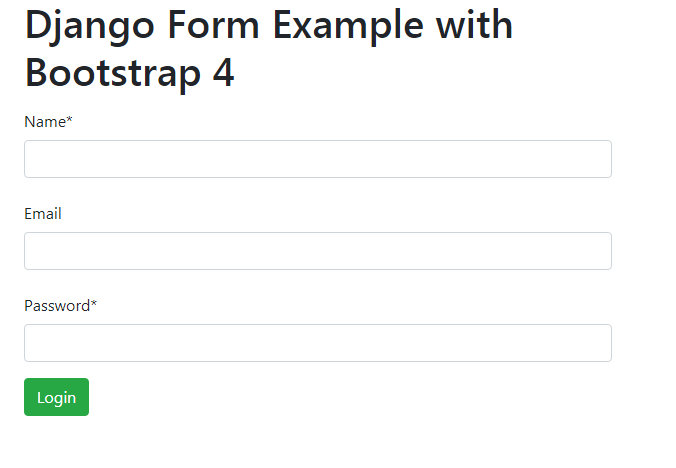 That's the end for this tutorial which showed you how to use Bootstrap 4 with Django Forms via the django-crispy-forms application. You can also visit the official docs for more information.